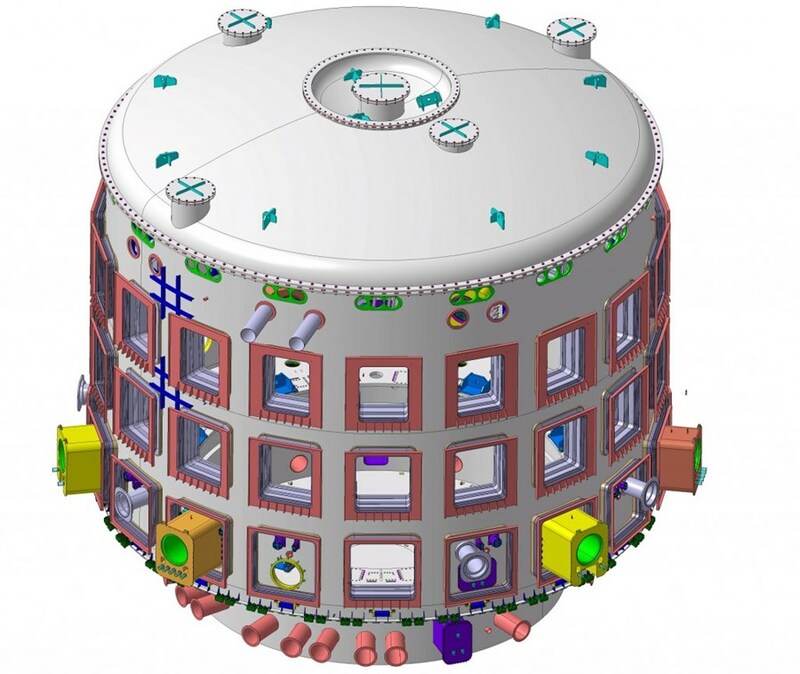 The ITER cryostat will be a fully welded stainless steel cylindrical vacuum/pressure chamber with overall dimensions of roughly 29.4 metres in diameter, 29 metres in height and a finished weight of 3,850 metric tons. The ITER cryostat will be the world's largest high-vacuum pressure chamber. On 17 August, the contract for the manufacturing of the 3,800 tonne steel-structure was signed with the Indian company Larsen & Toubro (L&T) Ltd. The cryostat forms the vacuum-tight container surrounding the ITER vacuum vessel and the superconducting magnets and acts essentially as a very large refrigerator. It will be made of stainless steel with thicknesses ranging from 50 mm to 250 mm. The structure will have to withstand a vacuum pressure of 1 x 10 -4 Pa; the pump volume is designed for 8,500 m³. Its overall dimensions will be 29.4 metres in diameter and 29 metres in height. The heavyweight will weigh in at more than 3,800 tonnes, making it the largest vacuum vessel ever built out of stainless steel. The cryostat will have 23 penetrations to allow internal access for maintenance as well as over 200 penetrations—some as large as four metres in size—providing access to the vacuum vessel for cooling systems, magnet feeders, auxiliary heating, diagnostics, and the removal of blanket sections and parts of the divertor. Large bellows will be used between the cryostat and the vacuum vessel to allow for thermal contraction and expansion in the structures. 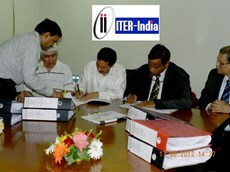 Shishir P. Deshpande (third from left), head of ITER India, and Anil Parab, vice president of the L&T Heavy Engineering division, signed the contract for the manufacturing of the ITER cryostat on 17 August 2012. India, being one of the seven Members of the ITER project, is in charge of procuring the cryostat. On 17 August Shishir Deshpande, project director of ITER-India and Anil Parab, vice president of the L&T Heavy Engineering division, signed the contract for the manufacturing of the ITER cryostat. The design of the ITER cryostat represented a huge international endeavour involving engineers and technicians from both the ITER Organization and the Indian Domestic Agency. "The cryostat is an essential part of the ITER machine. Seeing this huge component taking shape in the factory is certainly important and encouraging news. It means that the ITER project has entered a decisive phase," ITER Director-General Osamu Motojima said. The cryostat will be manufactured by the Heavy Engineering division of L&T at its Hazira plant, near Surat, Western India in the state of Gujarat. It will be dispatched in 54 modules to the ITER site in Cadarache, as it cannot be transported in its entire size. 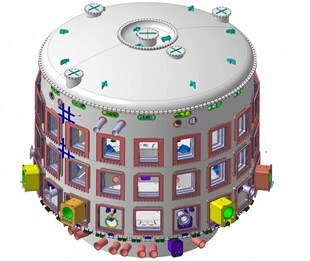 The cryostat modules will be pre-assembled in a temporary workshop at the ITER site and then transported to the Tokamak Pit, where they will be welded together by using the advanced "narrow groove all position gas tungsten arc welding technique." Mr. M.V. Kotwal, member of L&T Board and president of L&T Heavy Engineering, stated: "L&T is proud to be part of this mammoth global collaborative research to build a greener planet."